Jamila, left, plays on a seesaw with children of other female inmates on the prison yard of Pul-e Charkhi prison in Kabul, Afghanistan. Jamila, age 7 in the photo, and her mother Najiba who is serving a seven year sentence for adultery, have been in prison for since 2008. 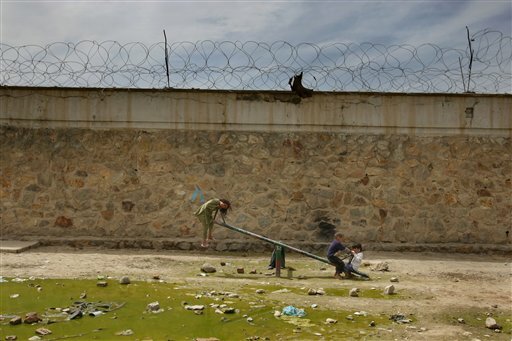 There are 226 young children in Afghanistan’s prisons, including many who were born there. They have committed no crime, but they live among the country’s 304 incarcerated women. Family Life Behind Bars is posting a new photograph each week that captures the sense of isolation and struggle when families and friends are separated during incarceration. The gallery will also portray the joy of reunions. We want to also provide an international perspective by showcasing images of people’s experiences from around the world. Many of these images (where credited) are provided with permission from the Associated Press. But we’d also like to showcase your experiences!